Air plants have only recently come into my life. I spotted them at a general store a few months ago and then recently they showed up at a nearby florist. If a plant can be trendy, these will be. I expect you'll be seeing more and more of the little guys in the next year or so. As far as plant life goes, they are pretty groovy. 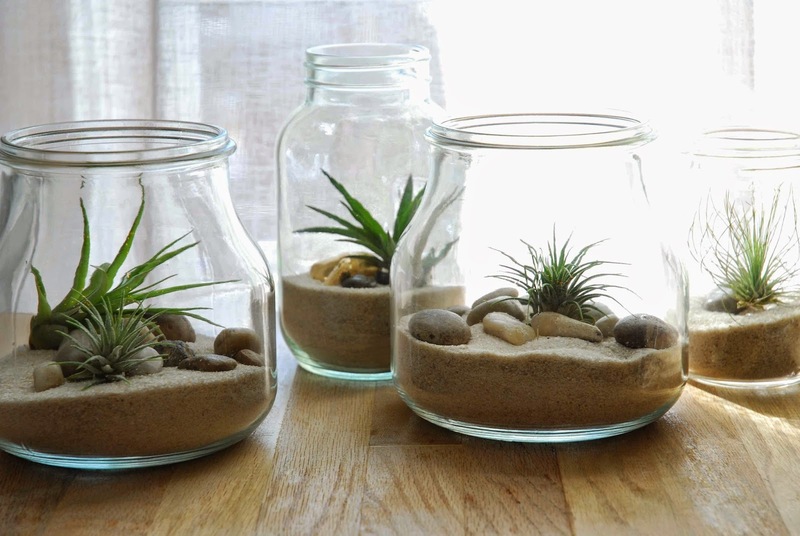 They don't live in soil, so you can place them anywhere, and do anything with them. I bought two and immediately had a million ideas about ways to use them. 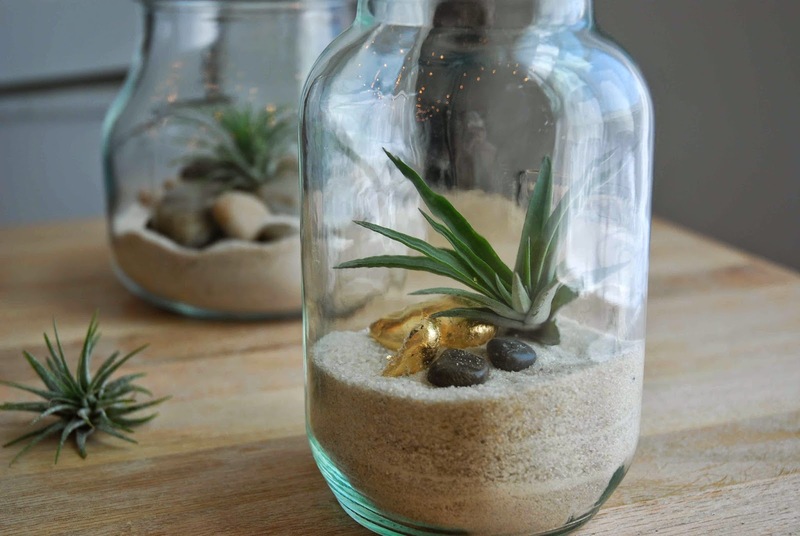 They are so free-spirited that you can actually attach them to objects and they will flourish. Wouldn't they be cute glued on to magnets and stuck on the fridge? I know that sounds kinds of cruel, but the magnet and glue won't hinder the plants at all! And they come in all kinds of shapes and sizes! The ones I bought were all 'small' and cost $5 each. Larger plants that I came across cost from $10 to $60, and some were obviously quite big! 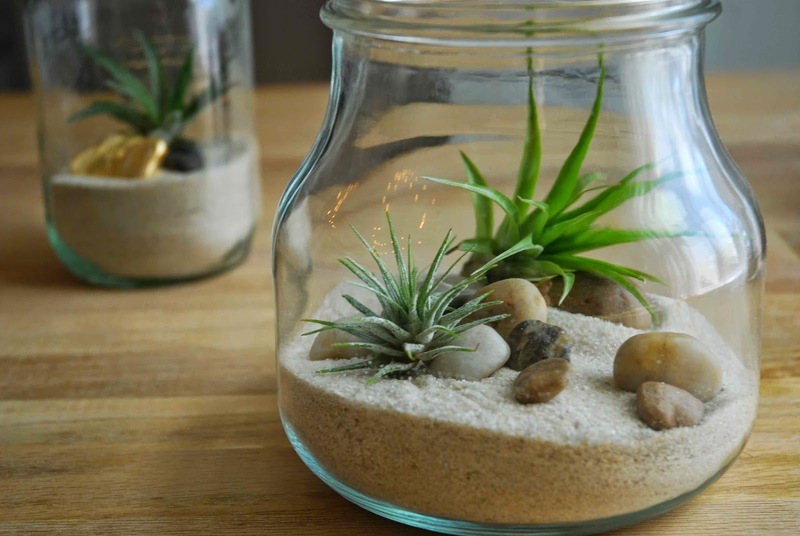 Because they don't need to be planted in soil, these plants make for an easy DIY terrarium project. 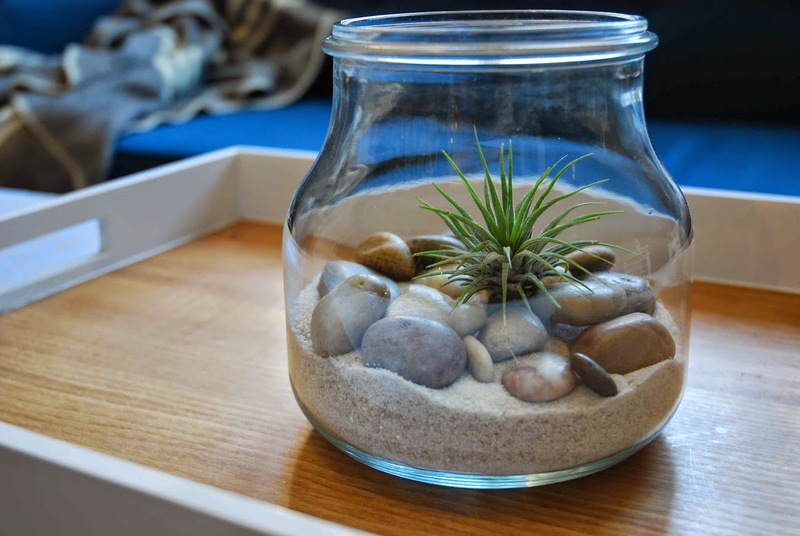 I used sand ($6 at a pet store that sells reptile products), pebbles and glass jars, but you could get very creative with your materials since anything goes! 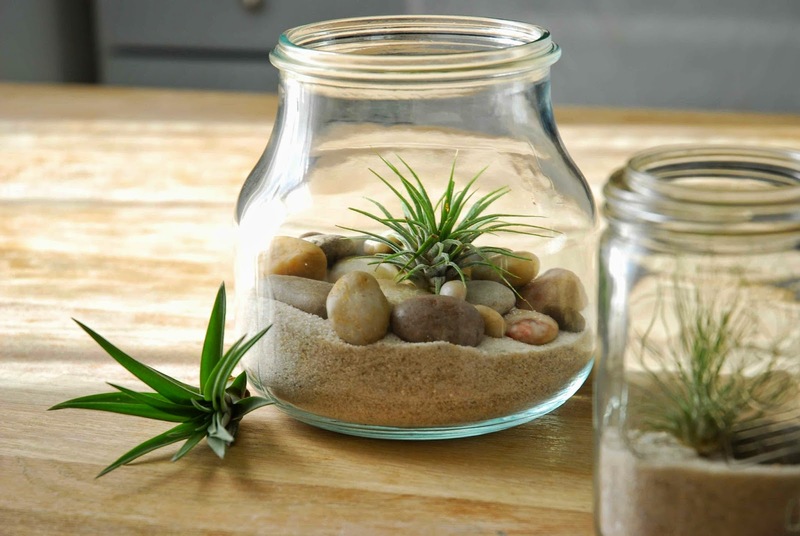 I simply poured the sand into the jar, placed a few pebbles, and gently added the plants. 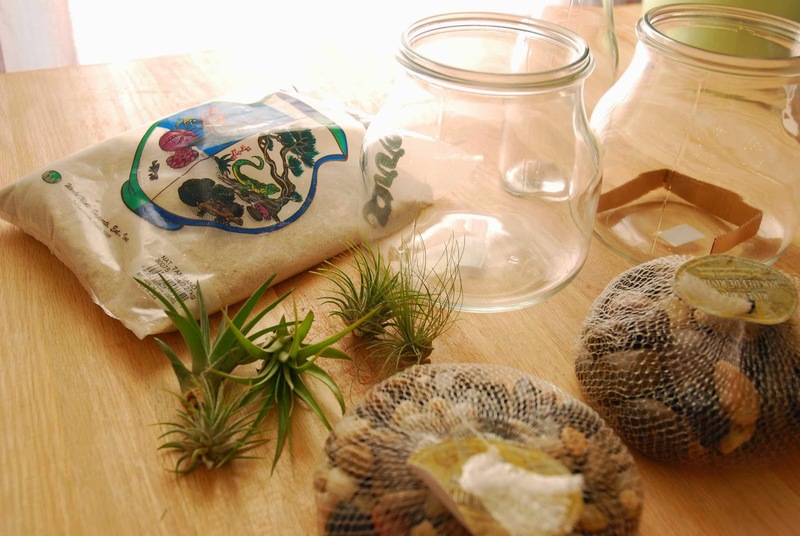 So much more fun than fussing with the typical soil and moss of typical terrariums. 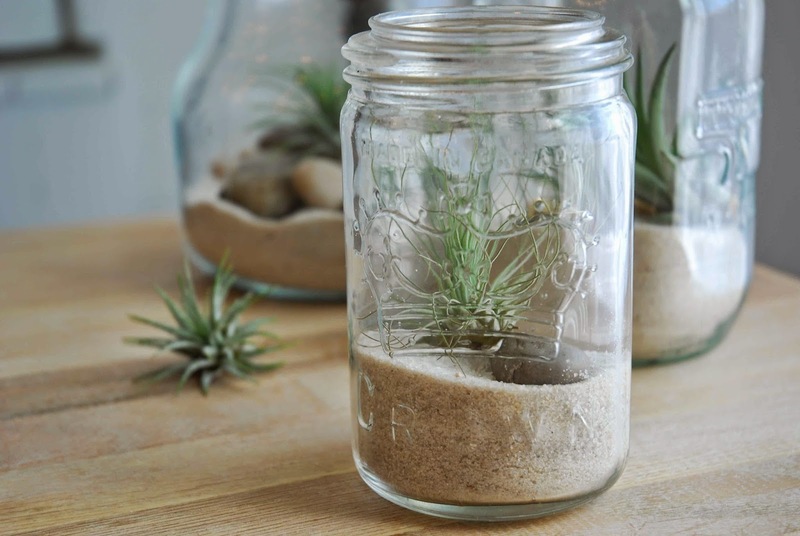 If you don't have a green thumb, this is the plant project for you! They're nothing but fun to create! 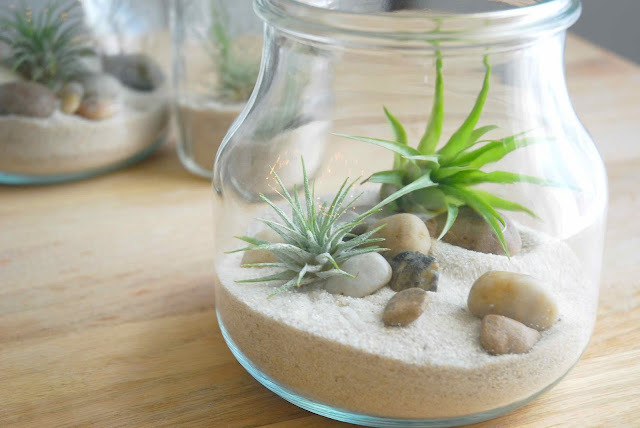 The look of the white sand and the little desert plants very bohemian and zen; it makes me think of Santa Fe, or a boho ranch house, or an apartment in an Urban Outfitters ad. So cool! The best part is that you are free to use any materials you can think of! Wouldn't these be fun to make with kids? You could make a whole mini terrain for dinosaurs to live in... or you could use the plants to landscape lego neighborhoods. 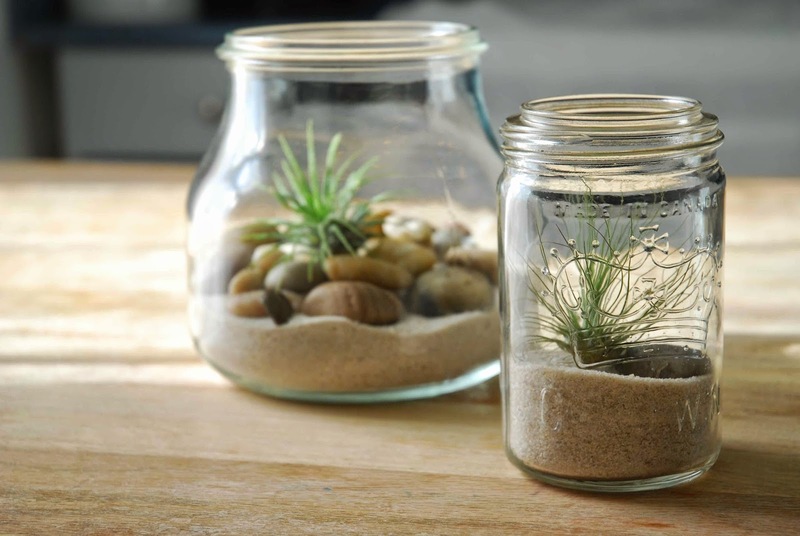 I used different jars to create a few terrariums. The large jars are from Ikea (I love their shape and have a few around the house for various storage) and the smaller ones are mason jars. 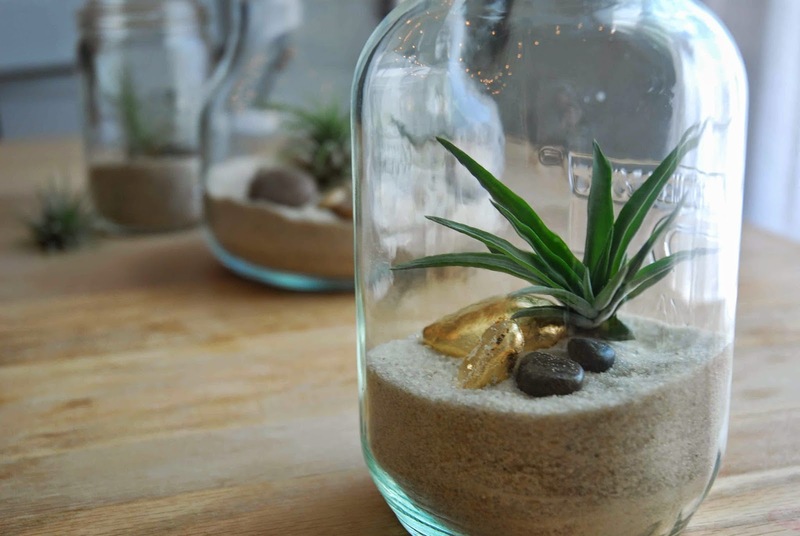 The terrariums are the perfect spot to place interesting rocks, geodes, or semi-precious stones. 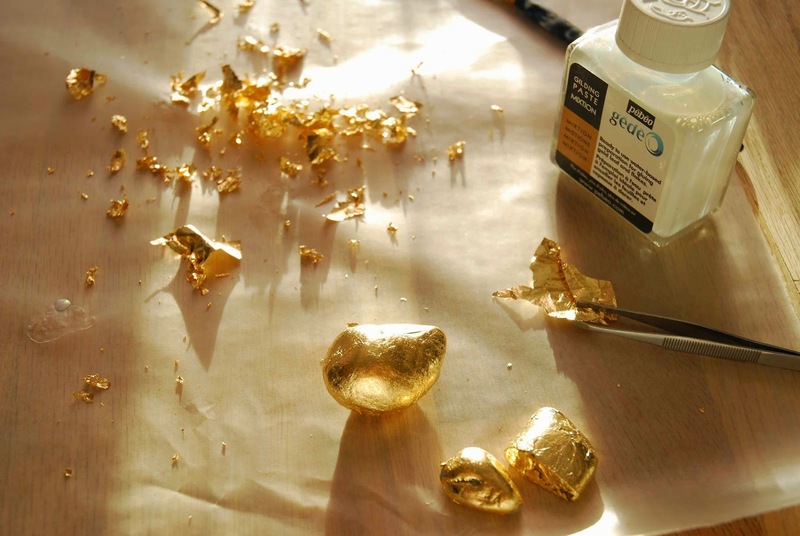 Gold leaf (or imitation gold leaf) is tedious to work with, but it lends a glimmer and shine that is hard to replicate with paint or other finishes. I like the look of two plants in one terrarium. Each one is so different, the contrast of shape and colour is really visually interesting. 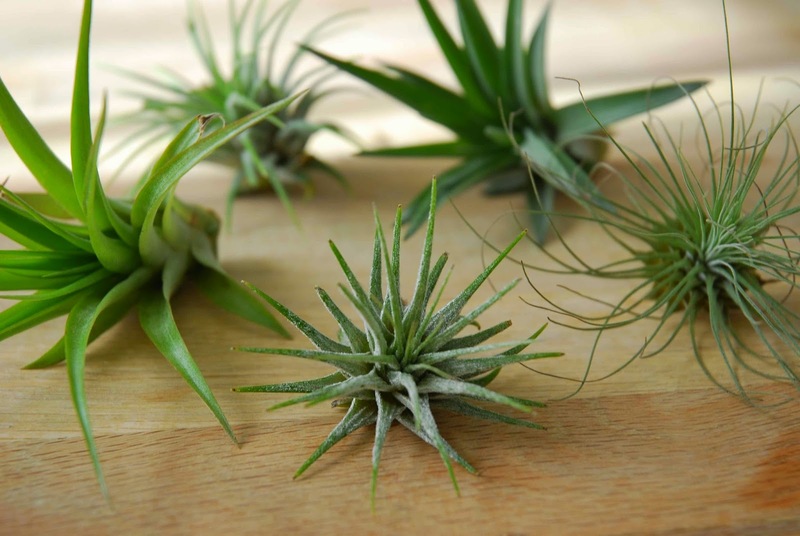 Caring for your air plant is easy! They need indirect sunlight and a 'bath' about once a week. 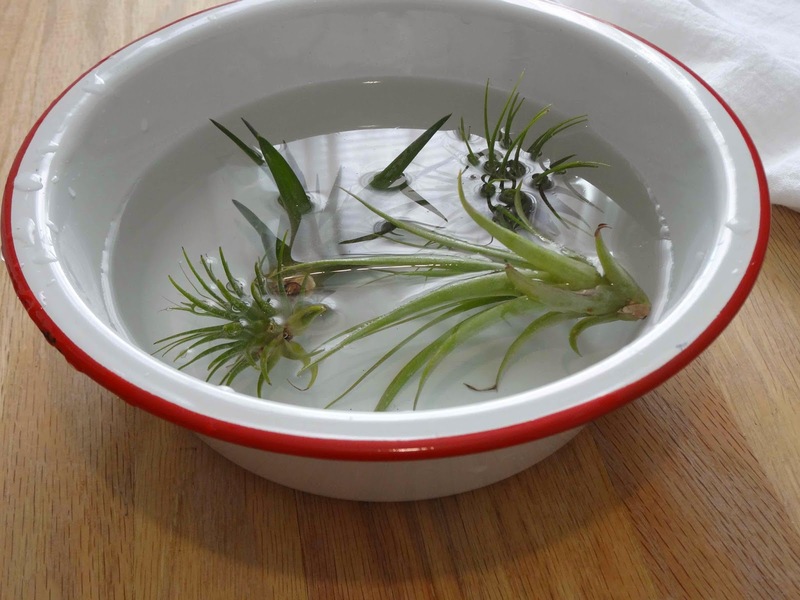 The care instructions that I read were very thorough and quite interesting as well, they are available online to read at the Air Plant Supply Co.
You can water your plants by giving them a 'bath' (a good soak), or a few 'showers' ( quick rinse under the tap). I'll be giving some of these as gifts... as you can see I got a bit carried away. Probably two would have been plenty, but they're just so darn fun to make! I have lots more little projects to share in the next week, so stop by the 11th for more crafty fun!